D.R. 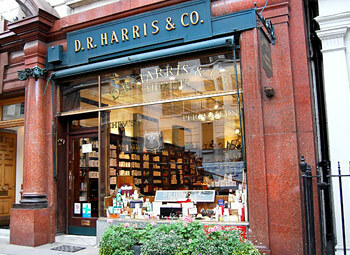 Harris & Co., the renowned British apothecary, has operated out of its St. James Street shop for more than two centuries. A family owned business with a few royal warrants under its belt, they still make the majority of their product range by hand and in-house, using traditional methods. The result is not only quality products but ones that are economical in the long run. Triple-milled soaps, for example, produce a rich, luxurious lather, but they're also long lasting. Other gentlemanly provisions include refreshing skin tonics, cooling mint lip balm, soothing shave creams and a classically scented, bacteria-killing deodorant. The fact that the throwback packaging looks sharp sitting next to the sink is simply an added bonus. D.R. Harris is stocked in British Airway's first class amenity kits.